WASHINGTON -- Now that details of the $110 billion arms package offered to Saudi Arabia are known, Lockheed Martin appears to be the clear winner among American defense firms. First, a caveat: Defense News broke the details of the roughly $84 billion in unknown weapons offerings that President Donald Trump brought with him on a May 20 visit to the Kingdom. But by the nature of how foreign military sales are completed, dollar totals are best-guess estimations and likely represent the ceiling for what could be spent. The figures listed may well come down, and the timeframes listed may well change, based on final negotiations around the equipment. , with an estimated $29.1 billion in potential sales. The world’s largest defense contractor has a stranglehold on several high-end, key programs sought by the Saudis. That includes seven THAAD missile defense batteries ($13.5 billion), and three KC-130J and 20 C-130J aircraft ($5.8 billion), as well as four multi-mission surface combatant ships ($6 billion) which are expected to be selected from Lockheed's design. The company’s Sikorsky arm also benefited, with two types of Black Hawk variants: 14 MH-60R Seahawk rotorcraft ($2 billion) and 30 UH-60 rescue helicopters ($1.8 billion). That could potentially grow. A statement from Lockheed, released after the visit to Saudi Arabia, claimed that a deal was being reached with Saudi company Taqnia to "support final assembly and completion of an estimated 150 S-70 Black Hawk utility helicopters for the Saudi government." A few other companies also fared well. 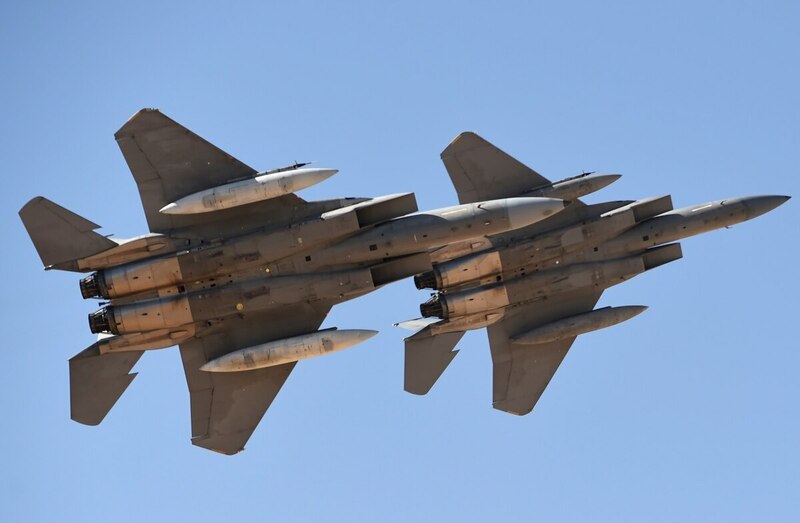 cashed in with an eight-year sustainment deal ($6.25 billion) for their F-15 aircraft, along with a relatively small $20 million deal to run a study on recapitalizing Saudi’s older fleet of F-15 C/D aircraft. big win came from an unknown type of enhancement for the Patriot missile system ($6.65 billion). But there is a chance for more growth, based on a set of unspecified aircraft and satellite programs. The list includes $2 billion for a light air support aircraft, type and quantity to be decided later. It also includes another $2 billion for four new aircraft to replace the Kingdom’s Tactical Airborne Surveillance System, which serves a similar role to the U.S. Air Force JSTARS. The light air support seems to have a fairly small list of options: either Textron with it’s AT-6 (or, perhaps, its Scorpion jet, still in search of a first customer) or the Embraer/Sierra Nevada team’s A-29 Super Tucano. Both the UAE and Jordan have ordered the A-29, so buying the Super Tucano would give the Kingdom commonality with two of its closest allies. The wildcard may be the U.S. Air Force’s OA-X experiment, which is holding a flyoff between the Scorpion, AT-6 and A-29 this summer. In theory, the Air Force is looking at replacing the A-10 with one of the three planes, but the service has been careful to stress this summer’s action is more of a fact-finding exercise than a downselect. At the same time, if the USAF shows a preference for one of the jets, the Saudis may look in the same direction. Bombardier team would benefit here. However, the TASS and JSTARS setups are somewhat different, and it may be the Saudis would look for a custom solution. Meanwhile, the Kingdom has been offered a clutch of satellites, with as-yet-unknown designs: two "Remote Sensing Satellites" estimated at $800 million and two satellite communications & space based early warning systems estimated at $4 billion. Given the focus on missile defense, the space based early warning systems could well be a derivative of Lockheed’s Space Based Infrared System (SBIRS) missile defense satellite. If so, the U.S. may be able to seek an arrangement with the Kingdom on information sharing, which would widen the overall capability of the missile tracking system. How quickly these contracts can be pushed through the system is an open question. Roman Schweizer, an analyst with Cowen Washington Research Group, wrote in a note to investors Friday that "precision munitions and missile defense remain top priorities for the Kingdom." "We think the elements of the package will probably go through as individual items, which could reduce opposition. We think some of the more easily defined items that have been either sold to Saudi before or to other countries could proceed quickly (such as THAAD, Patriot, precision munitions, helicopters, F-15, C-130Js, etc. )," he wrote.